Introductory textbooks on neurogenic communication disorders associated with aphasia and brain injury do not provide full documentation of the pervasive influence of perseveration in the diagnosis and treatment of clients with severe language processing deficits. 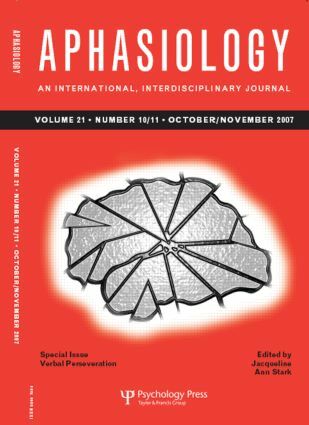 This special issue of Aphasiology aims to revives the profound interest in verbal perseveration observed in the classical German literature between 1890 and 1931. Various aspects of the phenomenon of perseveration are addressed in this issue. When and under what circumstances do perseverations occur? What are the characteristics of perseverative errors and how do they relate to non-perseverative sound and word errors? The papers share a common goal, namely to understand the origin of the phenomenon ‘perseveration’ in healthy subjects and clients with brain damage and injury. An overarching claim throughout the papers is that perseveration reflects the client’s primary language processing deficits. J. A. Stark, Preface to this special issue on Verbal Perseveration. H. W. Buckingham, Introductory Essay: Perseveration Happens. J. A. Stark, A Review of Classical Accounts of Verbal Perseveration and their Modern-day Relevance. M. S. Moses, L. A. Nickels, C. Sheard, Chips, Cheeks and Carols: A Review of Recurrent Perseveration in Speech Production. M. Moses, C. Sheard, L. A. Nickels, Insights into Recurrent Perseverative Errors in Aphasia: A Case Series Approach. N. Martin, G. S. Dell, Common Mechanisms Underlying Perseverative and Non-perseverative Sound and Word Substitutions. T. Ackerman, A. Ellis, Case Study: Where do Aphasic Perseverations Come From? T. Frankel, C. Penn, Perseveration and Conversation in TBI: Response to Pharmacological Intervention. J. Stark, W. Kristoferitsch, M. Graf, E. Gelpi, H. Budka, Verbal Perseveration as the Initial Symptom in a Case of Creutzfeld-Jakob Disease. J. Stark, Syntax detached from Semantics – Qualitative Analysis of Examples of Verbal Perseveration from a Transcortical Sensory Aphasic.